Artists from four continents are brought together by the first project of the "art place berlin" at the Park Inn Berlin-Alexanderplatz. The artists dedicated their works to the cosmopolitan, poet and dramatist Federico Garcia Lorca, who became an icon of political, artistic-intellectual and religious freedom after his assassination in 1936 by the Spanish fascists. 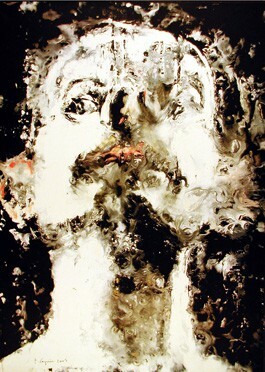 The idea for the project was born in winter 1977 when the Croatian art collector Toni Politeo went for a walk with the Spanish painter Luis Caruncho in Madrid. About sixty years ago a young Andalusian had continued his studies at the university of this city: Federico Garcia Lorca - poet and dramatist, musician and painter, freethinker and reformer, a friend of Salvador Dali and Luis Buñuel, and an avowing homosexual. In 1936, the fascistic Falangists put a violent end to his comet-like career at the age of only 38, after chasing him as a subversive writer, communist and antinationalistic gay. Garcias Lorca's literary work is deeply connected with the traditions of his Andalusian homeland. 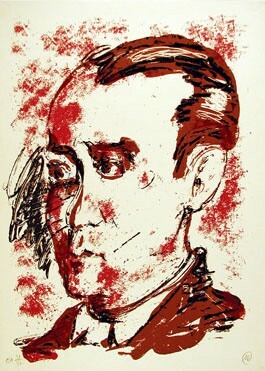 Born in 1898, as a son of a great land owner near Granada, Garcia Lorca studied jurisprudence, literature and philosophy, first in Granada, then, since 1919 in Madrid. He became co-founder of the later so-called "Generation of 1927" ("Generación del 27") a group of young poets between Symbolism and Surrealism. In 1927 the premier of his drama "Mariana Pineda" staged by himself and decorated by Salvador Dali was a great success in Barcelona. One year later his famous "Gipsy Ballads" appeared. Triumphal stays in New York, on Cuba and in Argentina were following. Although he was partyless, critical of society and belonged to a sexual minority he had friends up to the highest political ranks. Thus, in 1931 the proclamation of the Spanish Republic entrusted him with new tasks: hence he went on tour with the travelling theatre "La Barraca" passing the Spanish provinces to spread the Spanish classical theatre even to the remotest parts of the country. Back then a third of the population still consisted of illiterates. Alongside there were further stage plays in the making - among others the tragedy "Bodas de sangre" ("Bloody wedding") in 1933, his first box-office success. After Franco's putsch of the leftist "People's Front" government Garcia Lorca was caught by the Hitler-backed Falange in 1936, although he was hiding in the house of a poet friend in Granada who himself was a devotee of the Falange. Three days later he was executed by a gun shot near Granada without a legal trial. Thereafter his works were prohibited by the Franco-Regime.